NXP Semiconductors has NFC CARD developed NTAG203 - NFC Forum Type 2 Tag compliant IC – to be used with NFC enabled devices according to NFC Forum technical specifications , according to NFC Forum recommendations or Proximity Coupling Devices (PCD), according to ISO/IEC 14443A . The communication layer (RF Interface) complies to parts 2 and 3 of the ISO/IEC 14443A standard. The NTAG203 is primarily designed for NFC Forum Type 2 Tag applications (i.e. Smart Advertisement, connection handover, Bluetooth simple pairing, WiFi Protected set-up, call request, SMS, goods and device authentication and others). The anticollision function is based on an IC individual serial number called Unique IDentifier. The UID of the NTAG203 is 7 bytes long and supports cascade level 2 according to ISO/IEC 14443-3. 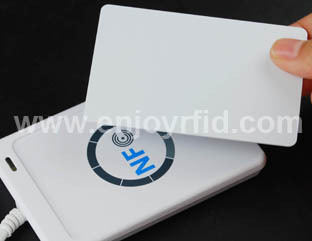 The two have combo cards NFC function equipment link, realize point-to-point data transmission. Based on the model. Multiple which has the function of N FC digital cameras, PDA, computer, mobile phone can be wirelessly to realize data exchange between subsequent associated application is the local application can also be a web application. Typical applications of the model are to assist quickly establish a bluetooth connection, exchange, mobile phone card and data communication, etc.